The South East Rural Towns' Partnership which has been set up to support rural towns across the region to maximise any benefits and opportunities open to them runs a competition each year for projects to find the best in Berkshire, Buckinghamshire, Kent, the Isle of Wight, Oxfordshire, Hampshire and Sussex. The Christmas in Whitchurch 2005 project has been selected as the winner in the Social and Community section. Details are now on the SERTP website. The project now goes forward to compete against the other 4 section winners for the overall South East Region Market Towns Award on 13th July. As described in the article below, Stewart Parrington and his team are already working on this year's Christmas in Whitchurch and other initiatives to improve the centre of the town. Pamela Forth, who lives in Indiana, is searching for information about her ancestors who lived in Whitchurch. She is descended from Isaac Norris and Harriet Fisher who were born around 1800 and died within a year of each other in 1872-1873. They had 3 children, George Norris, born 1831, who stayed in Whitchurch as a shepherd, and two girls, Ellen and Ann, who left for London. The Town Centre Revitalisation Project Team has been busy since Christmas in Whitchurch 2005 and is now ready to introduce and take feedback on the next phases of the initiative. The team will be holding an informal ‘Retailer Rendezvous‘ evening at the White Hart Hotel on 28th June. The Team Leader, Stewart Parrington, hopes that the town's retailers you will come along to hear future initiatives aimed at further raising the profile of Whitchurch. The glorious weather is bringing out Whitchurch's ramblers every Wednesday evening. Around 30 have enjoyed the first 11 of this year's walks. This week's is a moderate 4 miles from Larks Barrow to Bradley Wood, meeting, as ever, initially in Bell Street car park at 7pm. There is a new facility in Whitchurch for the 13 to 19 years olds. Basingstoke Rural Youth Work Team, together with the Whitchurch Youth Project are holding Chill and Chat sessions, offering advice, information and support, at The Cottage between 2.30 and 4.30pm on Thursdays. There will be drinks available and it will be somewhere to meet up and find out what is available in Whitchurch, Tadley and Basingstoke. From 5pm on Thursdays, the Rural Youth Work Team (Nick and Celia) will be in The Cottage from 5pm onwards, they invite Whitchurch's 13 - 19's to come along and say what they want from the new drop-in and what they want to get out of it. Or they can ring Kelly (Youth Worker) on 07722 147 888. The official Re-Opening of the Pharmacy, after an extensive refit, will take place on Tues 27 June at 11am. The Mayor, Cllr Hugh James, will officiate, and, in trying to retain links with the past history of the pharmacy (it has been open since 1770), Mrs Jean Duddington, daughter of Arthur Cox who owned it in the 1920's & 30's, and who grew up on the premises, has been asked to cut the ribbon. There will be freshly pressed fruit and vegetable juices for everyone, as well as free giveaways for young and old, a raffle, and 10% discount off all stock excluding prescriptions and restricted medicines. There will be a display of some old photos and history of the pharmacy in all its previous guises provided by Jim Chard. Andy Moss very kindly hosted a well attended meeting of Town Centre retailers in the White Hart on Wednesday evening. Stewart Parrington, explained his team's outline plans for Christmas in Whitchurch 2006. These follow on from the award winning 2005 event with Town Centre activities running for 3 weekends, starting with the switching on of the lights on 9th December. New for this year are planned wall mounted Christmas trees for all shops to improve the overall appearance and a Christmas Market in the White Hart car park. Tony Corbin explained about the proposed "Welcome Pack" for new Whitchurch residents. Brockenhurst have kindly offered to package information for newcomers to the town, this will included a printed version of the information contained on this website and offers an opportunity for retailers and other businesses to introduce themselves by inserts which could include "introductory offers" to demonstrate that there is no need to travel outside Whitchurch to obtain most goods and services. He then introduced a presentation from the Retail Skills Partnership on how EU funded marketing surveys of the town and its shops can help local businesses. He is working on the possibility of arranging this for the Town - who says nothing good comes out of Brussels! All 3 ideas were welcomed by all present. Tony closed off the meeting by saying preliminary 'officer' meetings were now taking place to determine how best to apply the expected £120k external (HCC/BDBC and possibly SEEDA) funding for 2007/08 to improve the appearance of the Town Centre. A shortlist of possible qualifying schemes, developed from the Town's Healthcheck findings and the work of the Town Action Plan teams will be put forward at the initial meeting of a 'Town Improvement Project Steering Group' at the end of July. Community consultation is expected to follow in the early part of next year. A poll of Whitchurch residents will take place in the Town Centre on Sunday 2 July to obtain their views on the Test Riverside path, number 18 on local maps. The survey is instigated by Hampshire County Council to assess how many people use the footpath and to ask a few questions regarding their use of footpaths in general. 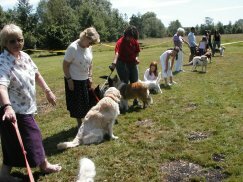 The Millennium Meadow's second Dog Day took place on Saturday and glorious weather rewarded all those who turned out. The new electrics were put to good use for the first time and all could hear what was happening thanks to the Meadow's newly acquired megaphone. Richard Adams kindly opened the event and Roy Dykes judged "to the satisfaction of all" (so Graham Burgess claims!). Those attending, including the Town's new Mayor and Mayoress, made good use of the picnic tables enjoying their own food and barbecued sausages (as opposed to hot dogs!). Activities in the Meadow continue through the Summer, details can be found on the events page. Weekly classes in Modern Jive* are now being help in Testbourne Community Centre (details here) for all levels of experience from complete beginners to experts. Once you have mastered (or rediscovered) the art, there are monthly social freestyle sessions in Testbourne Sports Hall. * For the younger reader, Modern Jive is a form of Ceroc, Le Roc, French Jive and a taste of simple dance varieties. Modern Jive is a partnered dance whereby the man and the lady rarely lose contact with each other and can be modified to almost any modern music or beat.